Screened For by Elaine Whittaker #ArtTuesday « Adafruit Industries – Makers, hackers, artists, designers and engineers! Elaine Whittaker stares at you while you look at the rest of her face, covered with a protective mask. 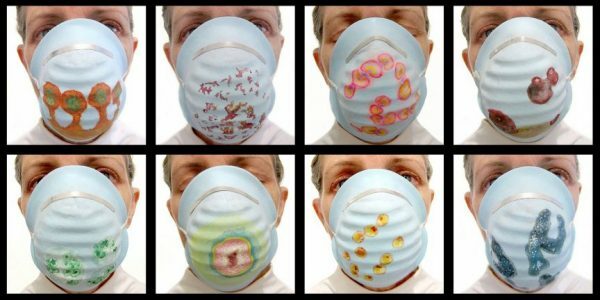 Painted on each mask – some of the deadliest infectious diseases known to us – Malaria, Ebola, and HIV/AIDS. Toronto-based artist Whittaker’s exhibition, Screened For, is a series of digital prints that feature larger-than-life portraits of Whittaker and the painted protective masks that she wears. This work has been exhibited in New York, Toronto, Seoul, Shanghai, and Australia. “People don’t understand the microscopic world,” Whittaker says. Microbes are a fundamental part of our lives; critical in forming life on Earth, they help grow and regulate our food supply, recycle waste, help us digest our food, fight infections and yes – cause them too. Whittaker’s painted images were sourced from microbiology books and websites.